Restore skin texture and improve skin appearance with non-ablative resurfacing. This laser treatment initiates a natural healing process that forms new, healthy tissue to minimize the appearance of wrinkles, pores, acne scarring, and blotchy pigmentation. We use the finest technology for our resurfacing procedures. The Palomar Icon and Nordlys Ellipse fractional resurfacing technology is the perfect choice for the treatment of wrinkles, acne and surgical scars, melasma, striae, unwanted textural irregularities, crow’s feet, blotchy skin and more, on virtually any trouble spot on the body – face, neck, chest, arms, legs. How Does Fractional Skin Resurfacing Work? 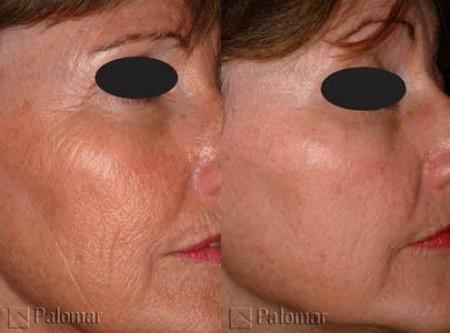 Fractional skin resurfacing with Palomar and Nordlys Ellipse uses laser energy microbeams to create areas of affected tissue that extend through the epidermis into the dermis. These areas can be either “non-ablative” (the laser beams coagulate the affected tissue) or “ablative” (the laser beams vaporize the affected tissue). Dr. Emery and the rest of our team have worked together to develop safe, effective protocols that consistently yield results for our clients.